Boz is a big fan of green beans and the pole bean trellis (but for different reasons). Lucky for me, the green beans form two feet off the ground. My Fortex and Romano green beans have sprouted, and they are looking for my support–something I’ve come to expect in a good pole bean. After trying all kinds of structures and contraptions–trellises, teepees, stakes, sticks, wattles, and poles–I’ve found a great solution for a long row of pole beans. It’s my tomato trellis, modified with vertical rungs of bamboo poles. Drive two metal end stakes into the ground the distance of the bean run, securing three wires between each pole. The wires are spaced a foot apart beginning a foot from the soil. Then, take tall sticks or bamboo poles and weave them vertically between the wires, forcing one end firmly into the ground for added support. Alternate the wire weave action in the next bamboo pole, working my way down the row. This creates strong tight wires to support the vertical bamboo/stick trellis. A couple months later, and you’ll be enjoying easy pickin’s. Brilliant as per usual Mr. Conway. I can’t help but think your vibrant drawings would make for an engagingly illustrated gardening book. We should definitely talk. Thanks Marky Mark, good idea. We should talk too. And not just about the index. Love Fortex thanks to Tom C. I am trying a new vairety to me this year- Soleil. Cant wait to see what they are like. That is if the snails will stop mowing them down. Beth, I’m trying a couple new bean varieties too: –Gold of Bacau: http://www.seedsavers.org/Details.aspx?itemNo=1185 and one called state half runner. You are so clever. You’ve also given me reason to spend 10 minutes wondering how far the urine mist rises. You never know– perhaps it’s exactly what your soil needs. The garden looks fantastic. I love the drawings. I know what Boz is really thinking, Green beans are great, but when are the raspberries going to be ready! I hope you have had enough sunshine for those delicious berries. Linda, yes ma’am, the raspberries berries are thriving, loving these cool nights. I’d say they are about two weeks out beginning ripeness. I have a couple new varieties: Royalty (purple), Fall Gold (uh, well gold), and Caroline (an autumn bearing berry). Your picking bucket is waiting. Tom, so glad to meet you on the Garden Tour, and so glad Sarah mentioned that you had a wonderful blog. I can see already that it will be inspiring me. Thanks neighbor. Nita, great to meet you! I’ll finish off the tour today, then step back into a little garden reality: weeding. Thanks for the kind words. Nice pictures & your drawings allways explain it well! Just found your site today and am sure I will be a regular visitor! thank you for visiting my sari sari blog, i enjoyed your comments on washington’s home and the siding material with sand, really interesting. i’ll be visiting again and look forward to your posts. I love the drawings too, looked back a few posts and the tomato trellis… yeah.. good idea! lovely illustration. A dog who loves green beans… precious… does he eat the dreaded Mexican Bean beetle. Under attack here this year – first time ever… YUCK!!!! I’ll be picking my first beans today! Have a great 4th of July weekend! I do enjoy your blog, does any one have a recipe for making fig jam from fresh figs? Hi Helga, thank you, and yes I’ve got a great recipe for fig preserves. I usually add diced candied ginger for a little kick. I’ll find the recipe and post it shortly. Cheers! Thank you so much for posting your plans for the bean trellis. We just installed raised cedar beds and I am trying to find ways to use the space efficiently. Best I have seen. First year without Hubby to stake the beans. No way I could do what he did so was looking for something “user” friendly. Have my metal stakes and will buy bamboo this week. Julie and Nancy, thanks for the kind words and here’s to a summer full of beans! Hi Tom, this is a rather odd request, but my name is Daniel and I’m a recent college grad trying to start up a youth program in Los Angeles. After settling with the name “Trellis,” I’ve been looking high and low for an image that would be suitable for a logo and I ran across your drawing in this page. It is quite simply one of the clearest, most beautiful drawings of a trellis I’ve seen on the internet (and I’ve seen quite a few). Can we get in touch to see if we might be able to use your drawing for our logo? (with credits, of course!) Thank you so much! Hi Daniel, I’d be honored to help. I’ll shoot you an email to discuss. Congratulations on your recent graduation and your running start to help the youth of LA. Bravo. I’ve been a gardener for years but this year will be my first time doing pole beans. I see your original post here was from 2010. Did you love this trellis system as much as you thought you would? Did you use it again last year? I also have a couple logistical questions. How far apart did you space the poles, and how many plants did you have growing up each pole? Hi Kristen, this is still my favorite way to trellis pole beans. I tried a netting method last year and it didn’t work as well., So this year I’m back to my bamboo pole – wire method above. I space the poles about 6-8″ apart and then plant 2 bean seeds between each pole, a couple inches apart. So usually two plants will grow up the pole. Works like a charm! Love your diagram — very easy to understand. My husband and I are trying a garden for the first time. 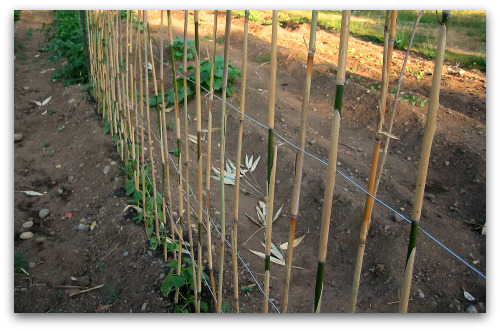 Do you have to use wire or can you use twine between the metal poles to be inter-twined with the bamboo stakes? Hi Kitty, you can use twine, you just want to make sure it’s not the kind that stretches or lengthens when wet. You want a twine or light rope that doesn’t give. Good Luck! Your idea looks great! What happens when beans keep climbing and nothing left to climb on will they still produce good. Hi Tamy, I’d say don’t make your poles any higher than you can reach. Who needs to chance it on a ladder in the soft soil of a garden. I find the trellis works well, if I”m lucky enough to have beans grow above the top, they will just bend back over, droop down and still grow and produce beans about eye level for a few weeks until the season is over. At least in my neck of the woods. Good luck. Good growing! Tom, Last year I planted some Pencil Pod Yellow Wax BUSH beans. (I prefer yellow beans for pickling.) I have looked all over for a yellow POLE wax(?) bean seeds. Are you familiar with any POLE type yellow wax bean? Also, if you have a favorite pickling bean recipe, would you be willing to share it? Prefer one with sugar in it; not the dilly sour ones. Hi Carol, better late than never I hope. I like Fortex green beans for green pole beans, awesome flavor and they never get stringy. For yellow beans I’ve only grown Soleil, which is nice but a bush type. And for sweet sour beans I use this recipe: http://www.tallcloverfarm.com/6575/recipe-asparagus-tips-in-a-pickle. Hi Robert, I use galvanized wire anywhere between 14 to 16 gauge wire thickness. I know this is an old post, so I’m not sure if you’re still checking these comments, but I’m interested in using your system of trellising for my first try at growing green beans. I am wondering what kind of hook/clamp you used to connect the wire to your t-post. Hi Ashley, I just fasten a wire tightener with wire to the T-post so I can tighten the extended wire. But that really isn’t necessary. You can simply pull the wire tight (wear gloves) and wrap it around the t-post a couple times then wrap the end around the tight wire to secure. Even if it seems a little loose, it will tighten as you put the vertical bamboo posts due to the weaving pattern. Good luck!